Preemie babies have more trouble with constipation than full-term babies for several reasons. Decreased muscle tone, preemie formulas and a history of bowel infections can all contribute to problems with stools in premature babies, even after they come out of the hospital. Talk to your baby's doctor if you think he's constipated, since decreased bowel movements can also indicate serious medical conditions in some cases. Constipation in preemies may be the result of several factors. Preemies often receive high-calorie formula with iron to meet their increased nutritional needs. Iron can cause constipation. As many as 66 percent of preemies also have reduced muscle tone for the first several years of life, states Helen Harrison, author of "The Premature Baby Book: A Parents Guide to Coping and Caring in the First Years." This includes the muscles that propel waste through the gastrointestinal tract. When the GI tract functions more slowly than normal, your baby absorbs more water from the intestine, making the remaining stool hard, dry and more difficult to pass. Many preemies also develop intestinal infections that damage sections of the bowel, sometimes permanently. The damaged bowel may function less efficiently. The number of stools your baby has each day doesn't define constipation. Many perfectly healthy babies only have bowel movements every few days, especially if you breastfeed, pediatric gastroenterologist Dr. Susan Baker of Women and Children's Hospital of Buffalo explains on BabyZone. Constipation refers to the quality, not the quantity of your baby's stools. Hard, dry and difficult to pass stools constitutes constipation, not the fact that your baby doesn't have a bowel movement every day. Straining, crying or grunting while having a bowel movement doesn't necessarily mean he's constipated, although it may. New babies aren't familiar with the sensations of passing a bowel movement and often react with facial expressions and noises that make having a bowel movement sound difficult even when it's not. (ref 6) Blood streaks on the outside of the stool can indicate difficult-to-pass stools. Never give a premature baby over-the-counter medications to treat constipation without your doctor's approval. If your doctor approves, changing your baby's formula, giving glycerin suppositories or simple measures such as a warm bath or gentle abdominal massage may help. Constipation might be an indication of other problems in a preemie newborn. Failure to pass meconium, the dark green first stool of newborns, could indicate not constipation but some type of intestinal blockage, including Hirschsprung's disease. Babies with Hirschsprung's lack nerve cells in parts of the large intestine that signal muscles to push waste through the intestines. Babies with cystic fibrosis can also fail to pass meconium stool in the first few days of life. 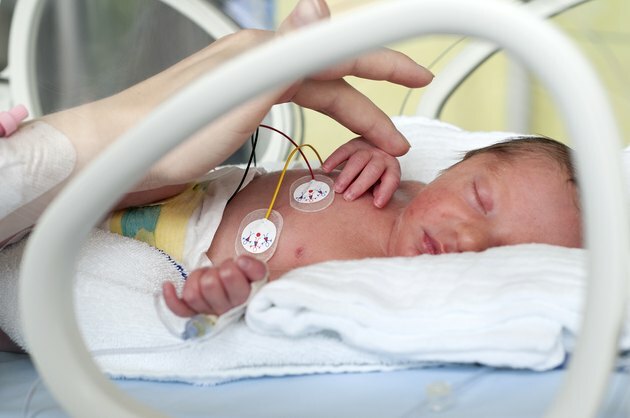 Preemie babies take longer to pass meconium than full-term babies; 99 percent of full-term infants pass meconium within the first 24 hours after birth, while just 37 percent of preemies do, pediatrician Dr. Vera Loening-Baucke explains in the November 1999 issue of "American Family Physician." Can I Take Milk of Magnesia When I'm Pregnant?